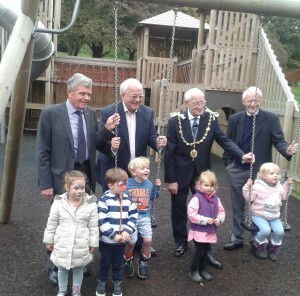 Christopher Biggins (Back centre left) and Maidstone Mayor Daniel Moriarty (Back centre right). On Monday actor and presenter Christopher Biggins swapped treading the boards and television cameras to visit Maidstone and open the new cafe at Cobtree Manor Park. Known for his theatre and television acting roles, as well as his warm personality and fun disposition, Christopher Biggins is one of the nation’s best loved characters. Having found fame through programmes such as ‘Porridge’ and ‘I, Claudius’ Biggins has also reached out to new generations of fans through his children’s television career (Rentaghost, On Safari) and lately has embraced reality television having taken part in ‘I’m A Celebrity…Get Me Out Of Here’ and stayed a household name through programmes such as ‘Celebrity Masterchef’. On Monday along with Maidstone Mayor, Councillor Daniel Moriarty, Biggins opened the new cafe at Cobtree Manor Park and posed for photos with some of the local children – even riding on the swings himself with a tot in his arms.